I feel as physical educators we have a lot to learn from one of my all-time favorite NFL players, Peyton Manning. 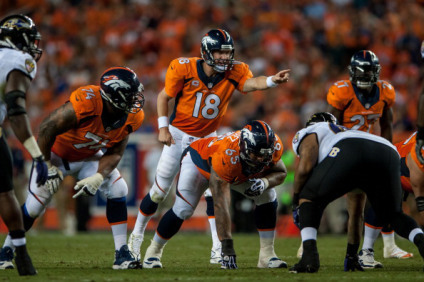 Even those who do not like the Broncos or Manning himself at least respect who he is and his a enormous work ethic. Manning never seems to be satisfied. He’s always thinking forward and finding ways to improve his craft. When it’s game day, Peyton Manning gets to the line of scrimmage and has complete control over the game. By being prepared, Payton can predict the defensive schemes/game plan. This is what led Manning to break the all-time NFL touchdown record last year. As a physical educator I believe with strong classroom management and relentless effort we can have this same success within our class. In order to have this success we must reflect daily on our practices. First of all, like any expert within their field it is essential to review and reflect on past experiences. I find the best way to do this as a teacher is by using systematic observation. Systematic observation is an incredible tool to evaluate ourselves and the many different aspects of our teaching. However, like becoming great at any task or skill it takes a lot of work. I plan to turn my office into a film room this year. By doing this I will watch myself teach and will constantly be reflecting on ways that I can improve my teaching. Before you use systematic observation it is important first find a way to regularly record your teaching. The best way to do this is to find a colleague or building administrator to record your lessons. Another option is to set a video recording device in the corner of your classroom with a view that encompasses the whole gym. One last option would be to purchase a Swivl. I have purchased one to help me video unassisted. Secondly, make sure that you have a wireless mic so you can hear the different interactions you have with students. Once you have found a way to record yourself you can start analyzing your teaching. There are many ways to so this. Below are a few that I highly recommend. I would advise you start by using time analysis. Time analysis is a great tool that allows you to look at the way you conduct management, activity and instruction episodes within your class. For an in-depth look at time analysis click here. Note: for the next three examples of systematic observation I have created a spreadsheet that streamlines the analysis process. Find the Excel or Numbers version both on google drive. After spending some time improving the way you manage class, I recommend you analyze your teacher feedback. Doing so will give you a honest look at the type of feedback you give students related to both skill and behavior. For a detailed description of analyzing teacher feedback click here. To continue our journey to becoming completely game day ready, I next recommend analyzing the following three topics: teacher prompting, questioning skills and other essential skills. Reflecting on questions you ask students to asses their understanding and your ability to prompt students before tasks is greatly needed for a successful in class. For more information on this click here. Next, it is so valuable and important that every student receives an equal physical education within our classrooms. I recommend that you analyze race, gender and skill-level interactions within your classroom to ensure students are receiving an equal education. For additional information click here. Lastly, I suggest you analyze student behavior. When we are able to break down the behaviors of students we can then better understand how to teach students. When students are not engaged in my class I believe that it’s my fault and I desire to take ownership of this. Using this systematic observation tool will help you to look in-depth at student behavior and start your reflections on how to improve it . Click here for a detailed description of analyzing student behavior. Overall, it takes a lot of work to continuley improve our ability to teach. The journey never stops. Just as Manning approaches the line of scrimmage with confidence in his ability to perform at a high-level, I know I can predict student behaviors, fully engage students and maximize learning opportunities if I put in the time. ← The #PhysEdSummit: Teaching Pedagogy that will take you to the top!